We realize that many of you don’t keep up with the latest Google trends and updates. How can you? Many of you are busy running businesses and there is only so much time in a day. Another large portion of you might outsource work on your website to an agency or WordPress maintenance company. But they too are juggling lots of clients. 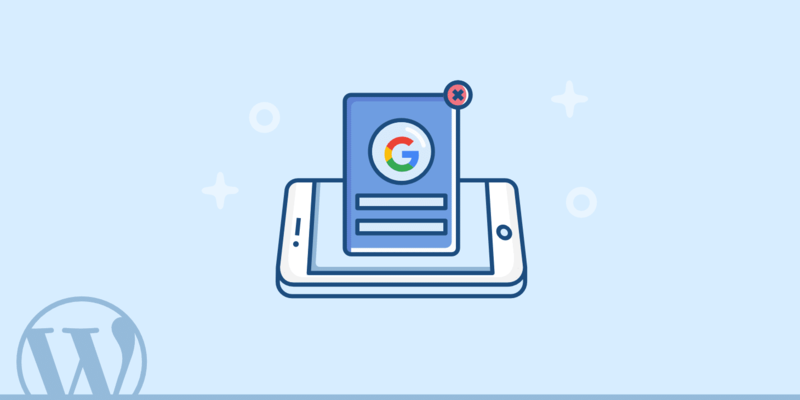 As of January 10th, 2017, the Google mobile popup penalty went into effect across the web. 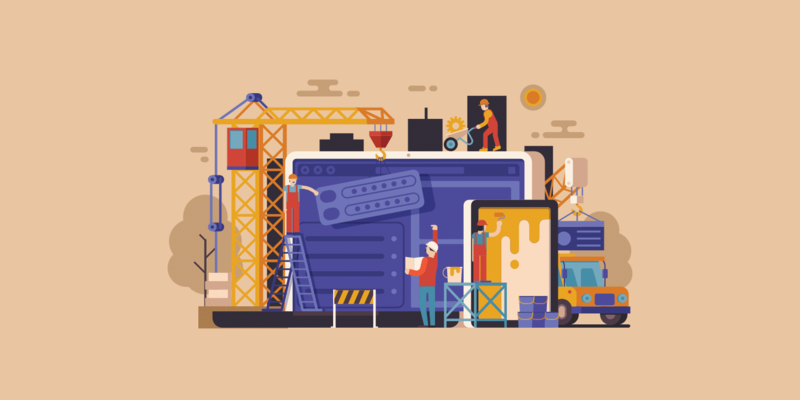 If you are seeing a major dip in mobile traffic lately, you might want to check your WordPress site to ensure you are using popups correctly. Read more about what this penalty entails below and what you can do about it. Google gave us plenty of time, as they originally announced the mobile popup penalty back in August of 2016 (Technically this is not a penalty, but rather a devaluing of your pages. But in most cases, the result is the same). Unless you are keeping up with the latest SEO trends and happenings, you could have easily overlooked this. The reason they introduced this was because popups can easily be frustrating for users. We have probably all been annoyed by popups at one point or another. By not allowing them on mobile devices this can allow for easier and quicker access to the content on the page. It is important to note that this penalty is applied on a page by page basis. Meaning, the page itself will be demoted in Google, but not the entire site. Unless you have popups running on your entire site, then you could see a global drop in SERPs, as each could take a small hit. And this penalty not only applies to popups, but all forms of invasive interstitials. Below are some examples from Google of what might ding you for the penalty. Showing a popup that covers the main content after the user navigates to a page from the search results. If you are using a delayed popup or one that triggers after the user scrolls part way down the page, these will also be penalized. Displaying a standalone interstitial that the user has to dismiss before accessing the main content. You know the big fullscreen welcome mats? They are a no go on mobile now. Push notifications are allowed because they only take up a small portion of the screen. Cookie usage and age verification’s. Anything that is legally required should and still can be used. Small app banners. Generally, best practice to ensure that not more than 1/4th of the mobile screen is taken up. Exit popups are not impacted. Google Adsense should also not be affected by the Google mobile penalty. Page-level ads, such as anchor/overlay ads and vignette ads fall within the acceptable guidelines. The anchor/overlay ads only take up a small portion of the screen and are easily dismissible. With vignette ads, they are not displayed when you come from Google’s page results to a webpage. They are only displayed when you go from page 1 to page 2 on a site. The mobile penalty only applies to traffic that arrives directly from Google. Also, if your traffic comes from anywhere other than Google, you could still use a popup. We are not saying you should, but if you have an intelligent way to show a popup only based on social traffic from Facebook or Pinterest for example, you would not be penalized. Glen Gabe, from G-Squared Interactive, posted up some examples of sites that have been negatively impacted by the Google mobile popup penalty. Some of them have lost ten or more spots in their mobile rankings. Depending on how much mobile traffic you get, losing 10 positions could mean losing thousands of visitors per day! Mobile traffic is also higher now than it ever has been, as nearly 60 percent of searches are now coming from mobile. Some that have never used popups are reporting the exact opposite, and are seeing an increase in rankings. This could be due to the fact that other competitors in their niche are getting penalized, or rather devalued. Below is an example of a client here at Kinsta that reported a 20% drop in mobile traffic, compared to the week prior. They lost almost 2,000 visitors in a 3 day period because of a bug with the popup plugin they were using. Apparently, the WordPress plugin they used for popups had a way to disable on mobile, but it wasn’t working correctly. This, in turn, resulted in loss of ad revenue for the client. They have since disabled that plugin and their rankings/traffic returned approximately 3 days later. So if you are wondering how long it takes to recover from the penalty across an entire site, that is a good approximation. If you use popups, welcome mats, or invasive interstitials you can check your traffic in Google Analytics to see if you have been hit yet. A better way to track this is with a keyword rank tracker tool. But if you don’t have one, your traffic should correlate with a loss in rankings. Apparently, even as of this week the Google mobile popup penalty update is still rolling out. You can expect probably a few weeks for the full impact of the update to hit everyone. 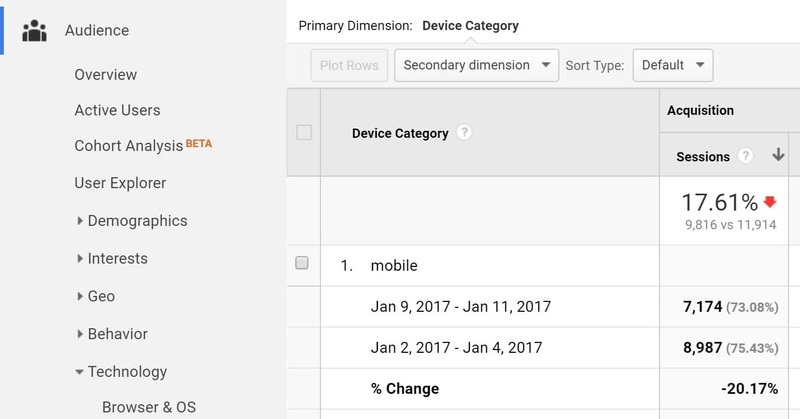 Click into your Google Analytics profile and in the filter in the top rate select the date range of Jan 9, 2017 – Jan 13, 2017 and compare it to the previous week. Under “Audience” on the left-hand side, click into Mobile > Overview. This will show you traffic for Mobile, Desktop, and Tablets. Obviously, because of the holidays, there might be a little fluctuation. But if you are seeing huge drops in mobile traffic, such as 15% or more, then most likely you are seeing the results of the penalty. 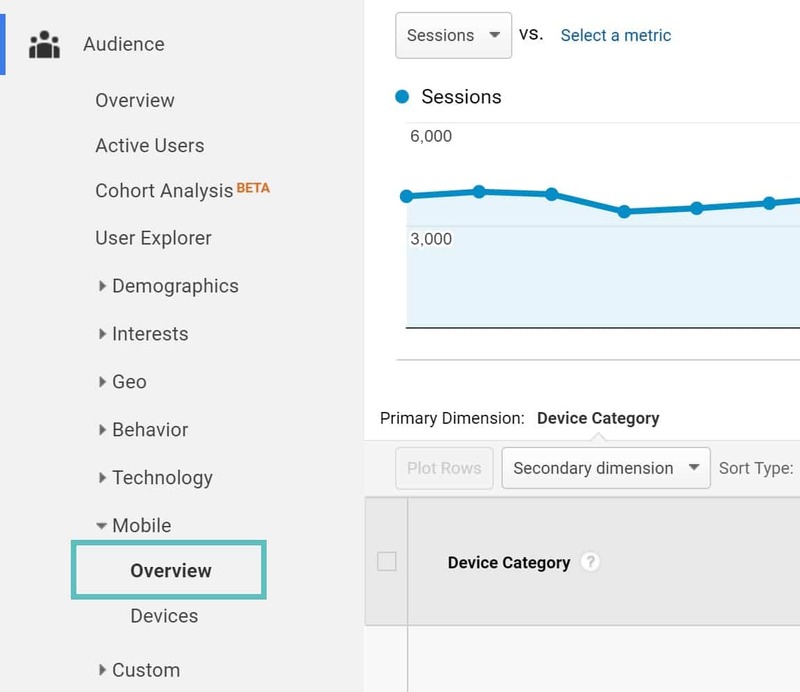 If you’re a Kinsta client, you can also check how much mobile traffic your site is getting in MyKinsta Analytics. The big question you probably have is what should you do about it? You have a couple options. The first would be to simply disable your WordPress popup plugin entirely. The second is to simply disable popups on mobile devices and continue to serve them visitors on Desktops. 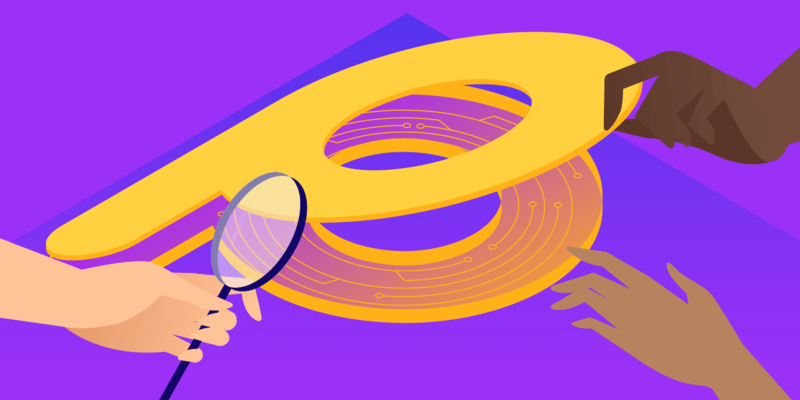 We use popups here at Kinsta, and they work quite well. We only use them at 50% scroll on our blog, as we don’t want them affecting the rest of our site or annoying our visitors. And we have never used them on mobile devices. If you don’t want to use popups, Kissmetrics has a great article on 10 ways to capture email leads without disturbing your visitors. A lot of plugins now have options to choose whether or not you want to display them on mobile. 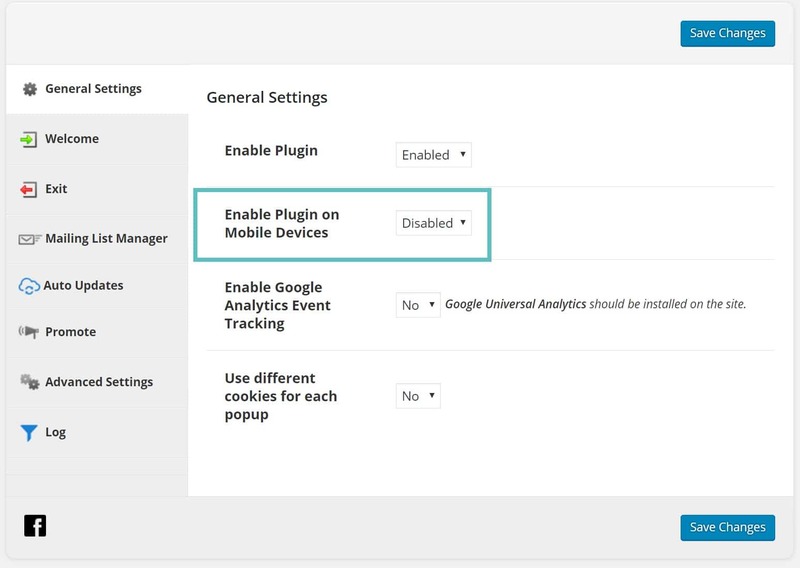 In the Ninja Popups plugin you can easily disable popups on mobile devices from within the general settings. 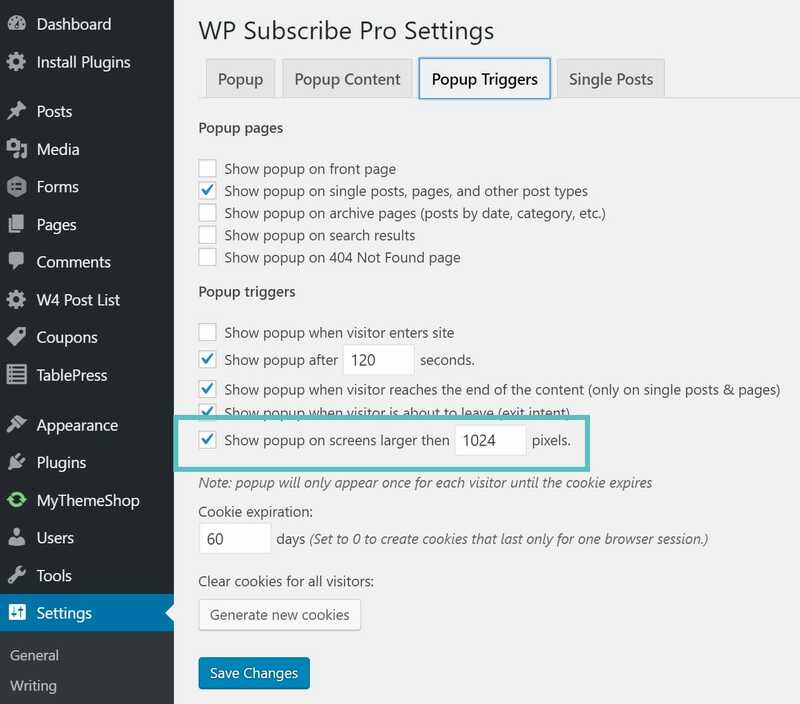 And here is an example in the WP Subscribe Pro plugin from MyThemeShop. However, we advise disabling popups altogether in this plugin for right now as there is a current bug with mobile device detection. Remember, even though these plugins have options, you should still test on your phone to make sure it is working. Also, if you are using the welcome mats from SumoMe, these too are also affected. They have a new feature called “Display Mode” found in the “Behavior” tab of all your mats which now lets you embed them below the fold. This complies with Google’s guidelines. You can read the official statement from SumoMe regarding the Google mobile popup penalty. You can always reach out to the developer of whatever popup or lead generation plugin you are using and inquire about how to disable the popups on mobile devices. If they don’t have an option, then it is probably time to find a new plugin ASAP. 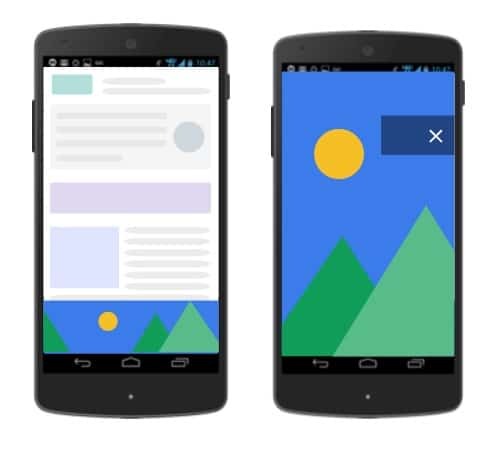 The last thing you want to happen is to be penalized in Google for showing popups on mobile devices. If you haven’t disabled them yet, now is the time to do so. And this includes welcome mats and all other invasive interstitials. The penalty is not permanent, so don’t panic too much, as you can expect your mobile traffic and rankings to return in a couple days. 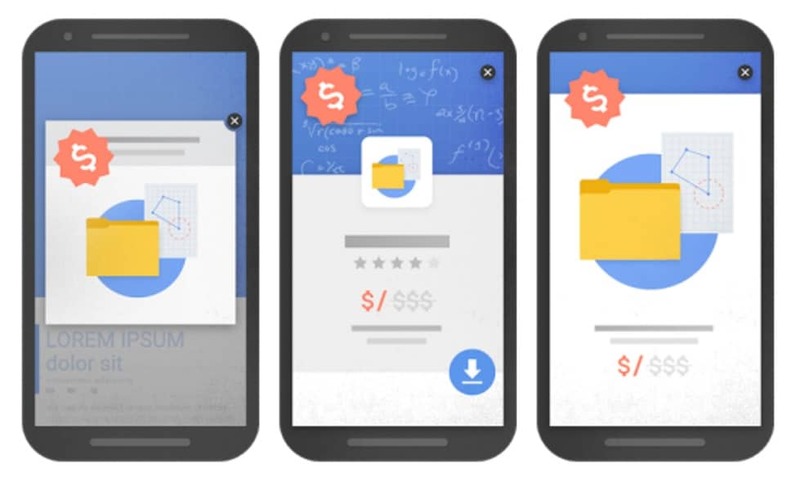 Were you dinged with the Google mobile popup penalty? If so, let us know below. Thanks for this sum-up of the situation. Informative! Thanks Kobe! Glad it was helpful. Great write up – that example is really interesting to see the hit and fix both effect mobile ranking so quickly. We’ve always used OptinMonster on our sites (popups are disabled on mobile by default with them) because of the awesome targeting options, but SumoMe is getting harder and harder to ignore with all of the extra add-ons you get. Question – is there a reason why you prefer a ‘scroll trigger’ rather than an exit intent popup? It seems like, if a user is 50% through your post, meaning they are interested in what you are saying, that smacking them with a popup right in the middle of reading is just as annoying as an instant popup? Awesome – that’d be a great test to see what performs better. Would love to see a heat map test as well to see if triggering at 50% has any impact on them moving farther down the post. So much to test, so little time. Thanks for responding. Great post again Brian. I have a question about this too. In these kind of conversion tests, do you think it’s right for the success to be measured on whether A or B gets more signups? Shouldn’t we count only those signups which converted into sales later when we nurtured those leads? I know this would take more time, but wouldn’t be more correct? Very helpful info Brian. Do you know (or anyone else) what I can do once my popups are removed? My organic traffic is still down at 10% of previous numbers. Can I resubmit my site or do I just wait?